There’s a recent book that details the techniques behind the manufactured big hits of the last few years. We have taken that manual and turned it inside out. They say a song needs a “hook” every 7 seconds. Really? We make music for people, not for distracted chimpanzees. They say you need a team of writers. A dozen is not unusual. We write our own songs. Our way. We are songwriters, it’s what we do. They say you don’t even need to learn how to play, the computer does that for you. We enjoy playing our instruments. The more, the better. We are musicians, it’s what we do. They say you don’t need to be a good singer. “Autotune” will make you sound perfectly in tune (and robotic). We sing with human voices, imperfect by nature. And real. We are singers, it’s what we do. They say, they say… We don’t care what they say! We make real music for real people. Slow cooked. It’s not for everyone, and that’s alright. And we're really happy to have you on our side. 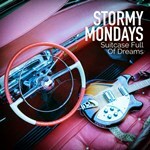 Stormy Mondays is a folk-rock band from Spain's rainy northern coast, playing a mixture of Americana, Soul, 60's British Invasion and Asturian folk.